Though many mainstream financial analysts categorically dismiss the idea that the dollar's dominance is in any way under threat, reports about the threats to the petrodollar have prompted many to question how exactly, does the average American benefit from the dollar's reserve currency status, and would the greenback's fall from grace have a negative, or positive, impact on the livelihood of the averagee American worker? Well, economist Steve Keen has a few theories about what might happen if the dollar stops being the vessel via which a large plurality of global trade is conducted. And he shared his views with Erik Townsend during this week's episode of MacroVoices. When most people think about the risks associated with the dollar losing its reserve status, runaway inflation probably ranks high on the list. But Keen believes these risks are probably overblown,for several reasons. First, importers often hedge out foreign exchange risk between two and five years out. And even once the dollar's weakness starts to bite, company's will often simply absorb some of the margin pressure to maintain market share. While prices might move marginally higher, Keen doubts the outcome would destabilize large swaths of the US economy, as the reserve alarmists have warned. Similarly, worries that a weaker dollar would cause interest rates in the US to skyrocket are also overblown, Keen believes. Just look at Japan: Interest rates have been mired near zero for 15 years now, regardless of what's been happening with the yen. Because it's not the external market that sets interest rates in the US - that's now the Federal Reserve's job. Circling back to the inspiration for this topic, Townsend asked Keen if he really believes the Saudis seriously considering ditching the dollar, or if these leaks are merely idle threats. Keen believes it's the latter, given how dependent the Saudis are on American support in the form of both supplying arms and purchasing oil. The real risk for the dollar lies in Europe and China. Europe's search for an alternative to SWIFT, which was inspired by Trump's decision to ditch the Iran deal, was a major catalyst for this. 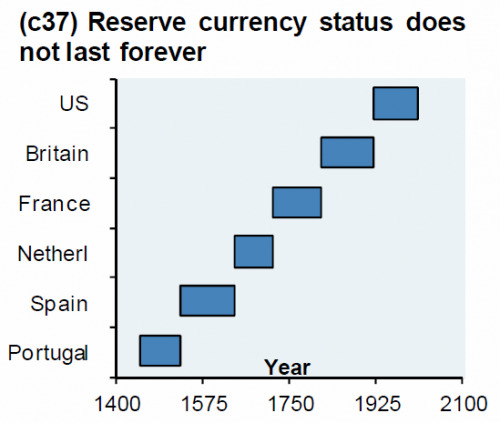 As Trump's belligerence toward America's enemies and allies has made the dollar's reserve status "intolerable" for many, Keen believes there's a "one in three" chance that the dollar loses its reserve status within ten years. That's not to say that this couldn't be stopped, but the more the US tries to impose its will on the rest of the world, the more likely other world powers will rebel. ...So, With America's allies and enemies looking for ways to mitigate their reliance on the dollar, what, ultimately, would be the impact if the world decides to ditch the greenback? While the decline in demand would probably cause the dollar to weaken, that could benefit the American working class. Given that President Trump's confrontation approach to diplomacy has caused this process to accelerate, as Europe, Russia and China have repeatedly, this is one way in which what Keen describes as Trump's leveraging America's reserve-currency status as a "thug's tool" (by threatening sanctions against its enemies), could circuitously benefit the working class Americans who make up a large portion of his base.